All of our weavings start out as white yarn, which is skeined in preparation for mordanting and dyeing. We use three main fiber types: silk, a very soft superwash wool, and Tencel (a Eucalyptus based rayon fiber). 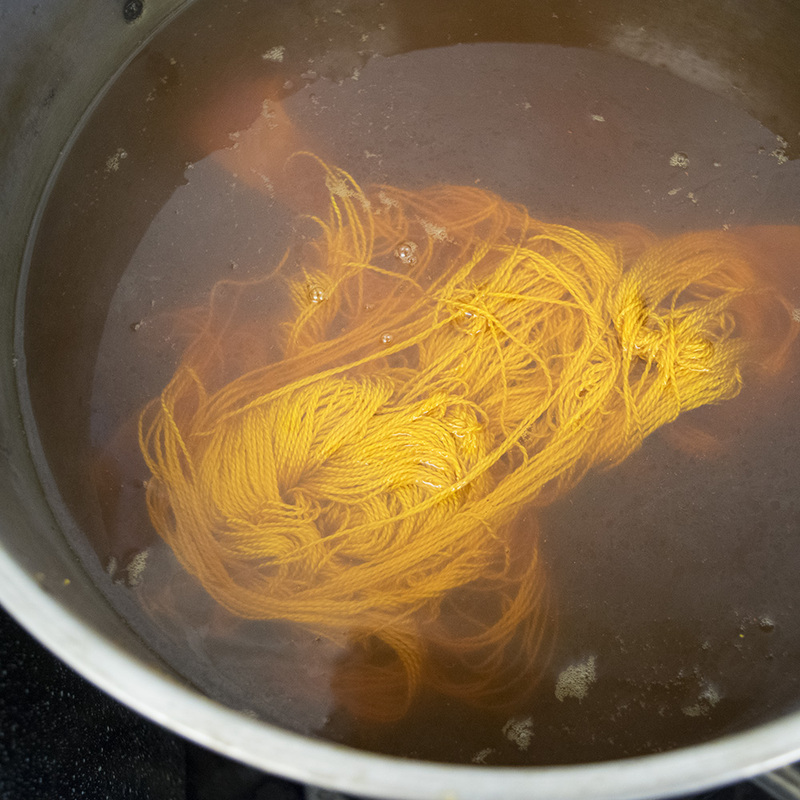 In order for natural plant dyes to bond permanently with the yarn, it needs to be heated with a mineral-based mordant before the dyeing begins. Once the white yarn undergoes these initial steps, it is ready for dyeing. Most of our dye baths are made by simmering the plant material, such as leaves, wood shavings, or powder, in a pot of water on the stove. After a few minutes on heat, the yarn is added and simmered for around 15 minutes to an hour. During dyeing, the yarn is stirred regularly to help the dye soak into the yarn. To achieve variegated colors, we also use other dyeing methods such as painting and steam setting the dyes. After dyeing, each skein of yarn is rinsed to remove excess color, hung up to dry, and wound into balls. The finished yearn balls are ready for the weaving process to start. Using our hand dyed yarn, we then wind long bundles of warp strands, which are hand threaded onto the floor loom in a specific sequence for each project. Once threading is complete and the yarn is fully wound onto the loom, we hand weave each piece one weft thread at a time. The unique pattern for each piece is controlled by the threading and the sequence of foot treadles we step on to raise and lower specific threads. We finish every weaving by hemstitching the edge, which secures the warp and weft threads together and creates a clean finish. As a final touch, we also twist the fringe on many of our weavings. Each completed weaving is a one-of-a-kind piece of wearable art!